SuperCloset Reports Surge in KIND LED Grow Light Sales, Saving Indoor Growing Enthusiasts up to 40% on their Power Usage. SuperCloset, the leading provider of complete indoor cabinet and tent hydroponic growing systems, has been including the award winning KIND LED Grow Lights in their kits for a few years now. The undeniable benefits to this new technology have changed the perception of indoor gardening forever. Once considered an unproven alternative to HID lighting, the new Kind Led Grow Lights have taken the industry by storm with perfectly tailored light spectrums in an ideal, low heat, and easy to use unit. More than half of every SuperCloset and SuperRoom sold are now out fitted with KIND LED, proving the stigma is gone and LED Grow Lights are here to stay. The overwhelming positive response from customers and their first hand experience using the new LED Grow lights has flooded in. From impressive yields, to reliability and simplicity, there has been little to slow this trend. The LED lights included in such best selling cabinets as the SuperCloset Deluxe LED 3.0 draw 40% less energy than their HPS equivalents. Indoor gardeners are now free of any concerns for needing specially designed cooling systems for their grow lights or a need to change bulbs when moving between vegetation and flowering stages. Plug it in, set your timer and you are good to grow. 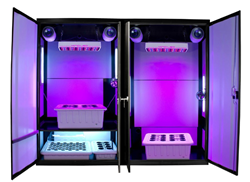 For more information on how to upgrade your existing indoor gardening kit or to find out how to get a complete growing system shipped right to your house, contact your SuperCloset representative and join the family of successful growers outfitted by #1 Grow Cabinet Supplier in the world, SuperCloset.com.